Justin Beckett and Beckett’s Table hold a special place in our heart. If you read our interview with Chef Beckett a while back, you’d know that he was the first chef in town to give us an interview. This was all the way back when Geeks Who Eat was Geek Eats on DAPs Magic. Beckett’s Table was the first restaurant we ever went to for Arizona Restaurant Week as well. In essence, Beckett’s Table and Chef Beckett have been with us on our journey and are basically food family to us! 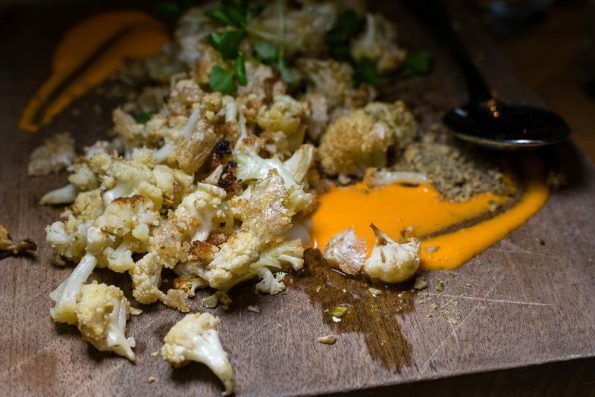 Roasted Cauliflower (Romesco, Pork Cracklins, Lemon Oil, Pepita Gremolata)- There is something wonderful about oven roasted cauliflower. It is just so much better than any other preparation. Not to mention, there are pork cracklins in this cauliflower! Do not stop, do not pass go, do not collect $200, just go eat this cauliflower! 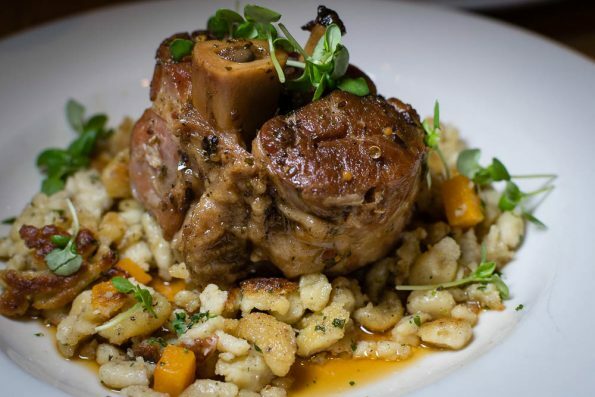 Pork Osso Bucco Confit (Roasted Garlic and Black Pepper Spaetzle, Butternut Squash, Golden Raisin Pepita Gremolata)- This was probably our favorite of the evening. Not only was the pork tender and flavorful, but the spaetzle was to die for. Normally spaetzle is kind of boring and lackluster. Not this time folks. This was garlicky and peppery. We kept going back for more! Honestly, we could eat just a bowl of this spaetzle and be happy. 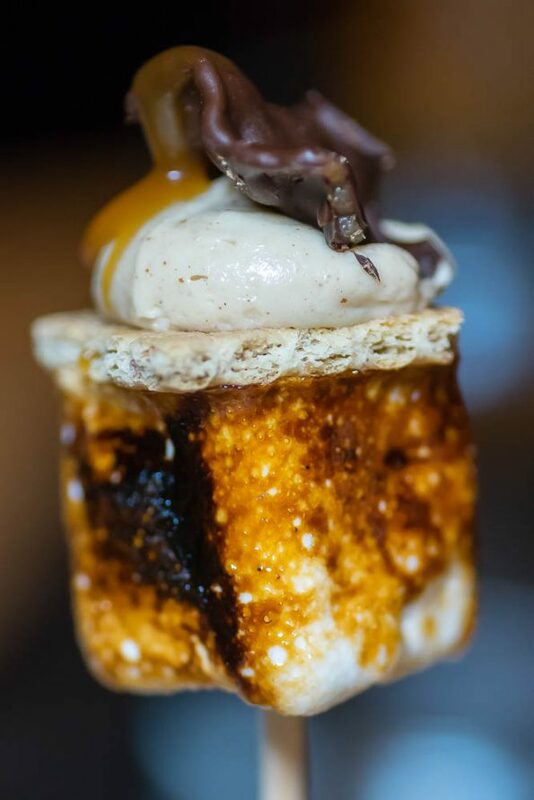 Chocolate Dipped Bacon S’mores (House-made Marshmallow, Caramel Whipped Peanut Butter, Graham Cracker)- This is one of those desserts that is not only delicious (um, hello… peanut butter and bacon?) but presented beautifully. The S’mores come out on sticks secured in a piece of wood. It is one of the coolest looking desserts in the Valley. 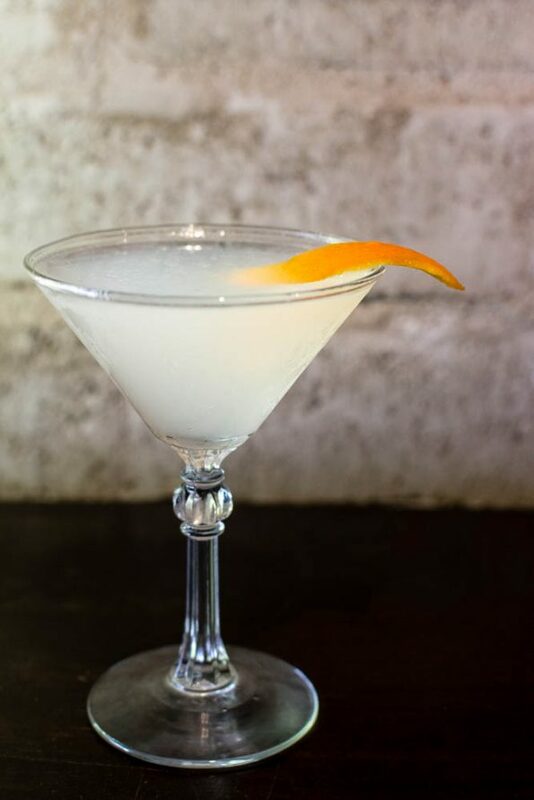 Suzy’s Little Helper (Azzurre Gin, Cointreau, Lillet, mist of Absinthe, Lemon Juice)- Suzy’s Little Helper is a new cocktail on Beckett’s Table’s cocktail list. Named for a regular (when do we get a cocktail? ), the combo of gin, Lillet, and absinthe make an interesting flavor and it is really enjoyable. We really love Beckett’s Table! Even if you aren’t sitting at a communal table, the feeling in the restaurant is definitely that of a family meal at home. Have you been to Becketts Table? What’s your favorite thing on the menu? What is your favorite deviled egg creation by Chef Beckett? We want to know! Leave a comment below or use the hashtag #GeekEats!